The spiritual leader of Ombatse group, Lega Agu, otherwise called Baba Alakyo, will on Monday (today) appear before the Judicial Commission of Inquiry into Alakyo killings to give testimony on his alleged role that led to the death of over 70 security personnel on May 7th, 2013. His appearance is however hinged on the condition that Governor Umaru Tanko Almakura signs an undertaking that the Ombatse leader would not be arrested, the chairman of the commission, Justice Joseph Gbadeyan, disclosed in Lafia at the end of Almakura’s testimony in Lafia Government House. The attorney general and Commissioner for Justice, Mr. Innocent Lagi, assured that he will appropriately advise governor Almakura on the gain of Baba Alakyo’s appearance. 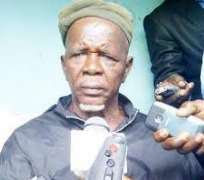 Baba Alakyo, it will be recalled, was fingered to have masterminded the killings of security operatives of the Nigeria Police and the SSS sometime in May this year at Alakyo village saying it was his god that killed the security operatives. Though he has continued to deny such allegations.